The Siamese cat breed’s origins are not exactly known, but it is almost certain that it is Eastern in origin. Manuscripts found in Ayudha have writings of their native cats. Ayudha was the ancient capital of Siam, now Thailand. The Cat Book Poems, or Tamra Maew (dating back to 1350) has a drawing of a pale-coated cat with a black mask, tail, feet and ears. 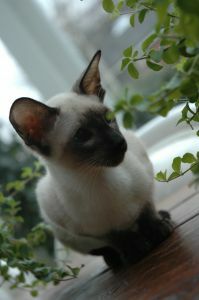 The Siamese was first shown in Europe in 1871 at the Crystal Palace Cat Show in London. In 1879 the first Siamese made its way into the USA as a gift to the wife of President Rutherford Hayes from the US Consul in Bangkok. 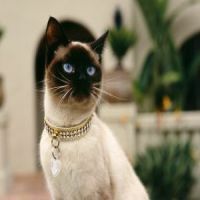 Originally, the Siamese cats that were shown were seal point cats, but chocolate, lilac and blue colors started to appear and were accepted for show. In the 70’s, red and cream points and tabby points made their appearance and in 1989 the silver tabby and the smoke points were accepted for shows. Particolor pointed Siamese cats were also accepted around the same time. TICA accepts all colors and patterns of the pointed category for show. "The Siamese cat combines the grace of the panther, the fleetness of the deer, the softness of down, the strength of the tiger, the affection of the dog and the courage of the lion...they are a continual study in symmetry, grace and elegance." Extract from the book "This is the Siamese Cat" by Marge Naples, 2nd edition 1978. 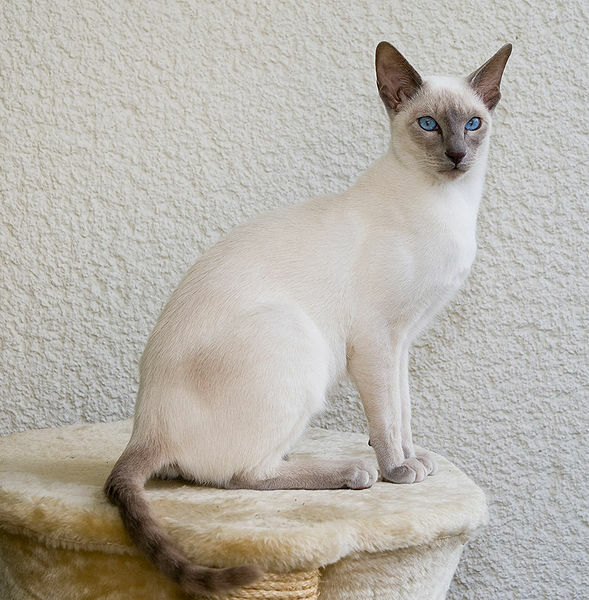 The Siamese is the parent breed for the Siamese Breed Group which includes the Oriental Shorthair and Longhair and the Balinese which is a longhaired Siamese. The head is triangular in shape with big triangular ears. 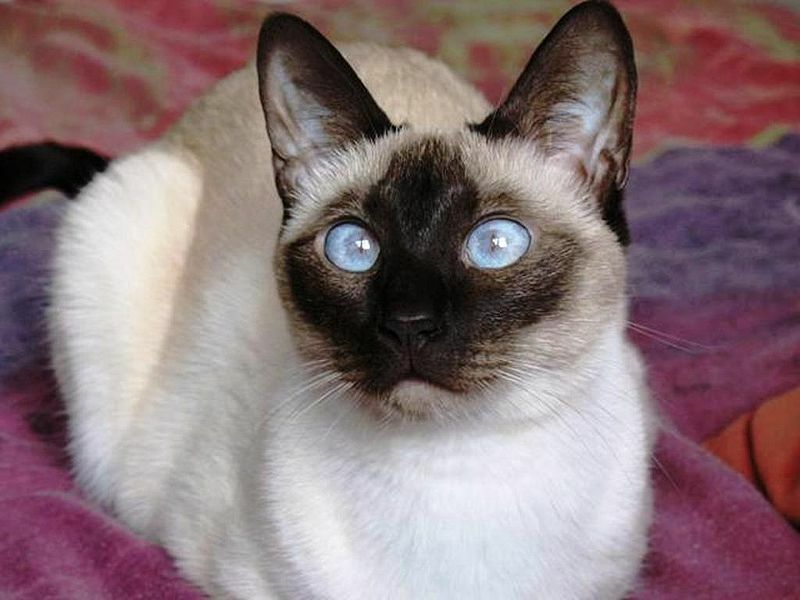 One of the distinctive features of the Siamese is its eyes – they are almond-shaped and expressive and come in a deep, rich blue. 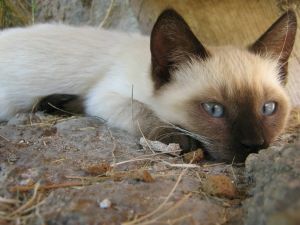 The Siamese Breed Group is the only breed of cat that has the oriental slant to their eyes. The looks of the Siamese immediately attracts your attention because of the contrasting colors. The points (ears, mask, legs and tail) are all a darker color with the body being paler. To keep the coat in perfect condition, you will have to brush your Siamese once a week. To keep the coat glossy, you can run a chamois cloth over the body once you are done with the brushing. The Siamese cat breed is perfect for you if you are looking for a cat that is constantly by your side. They are loyal, affectionate, highly intelligent and social cats that are known “talkers.” The voice of a Siamese does not lend itself to being ignored – when a Siamese speaks, you listen. This is not a cat that can be left on its own, even for a short while. If you are not able to give your Siamese the attention that he deserves, make sure that you get a companion Siamese cat. A Siamese will quickly learn to play fetch and as long as you are willing to throw a mouse or a piece of crumpled paper, they will play. Siamese cats love to cuddle, whether it is with each other or on your lap. In general, Siamese cats are a healthy cat breed, although there are a few health issues that could come up. Kittens seem to be very susceptible to respiratory infections and they should be kept out of drafts as far as possible. Cardiomyopathy (feline heart disease) is a concern but is not a rampant disease in the Siamese cat breed. Siamese cats seem to be more sensitive to anesthesia than other cat breeds and can have severe allergic reactions to the medications used for anesthesia. Your veterinarian should be able to answer any questions you might have about the precautions that can be taken to minimize the risks. Siamese cats are also prone to agenesis of the upper eyelid, a condition in which the upper eyelid fails to develop in the womb. If you would like to learn more about caring for your Siamese cat, this site is highly recommended. Learn everything you need to know about this unique cat breed. From behavior, to history to fun facts and more! Do you have a story about your Siamese cat that you would like other cat lovers to hear about?